Kiriba-ru sent me a Samsung LH351D for testing. 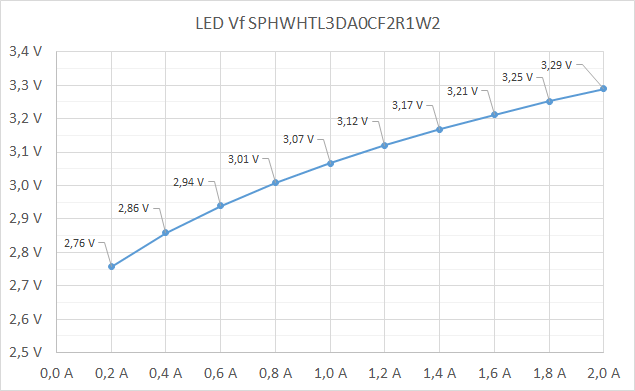 The emitter tested is a model number SPHWHTL3DA0CF2R1W2 with 5000K, CRI70 and rated luminous flux of 460lm at 1050mA. It fits on a XP/219/319 MCPCB. Now I’d like to test the higher CRI options, which are also plentiful. 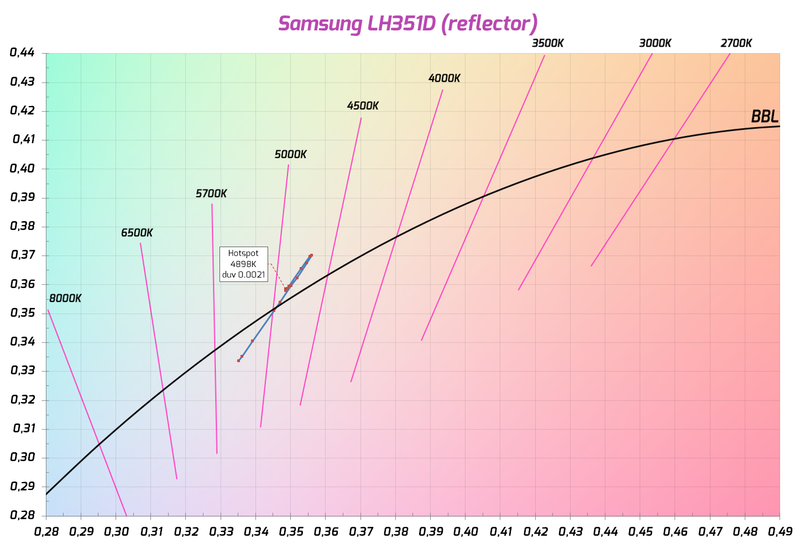 Visually I’d rate it close to the Nichia 219C 5000K R8000. Very nice and neutral white tint (4900K, duv 0.002), no bad sudden tint shifts, rings or discolorations in the beam, mostly a big pure white hotspot that fades quickly. Just a bit cooler on the outer edge. The warmer/yellower corona is not very noticeable, much better than on the new Crees. On the other hand, it doesn’t play nice with a big SMO reflector from the Eagle Eye X7. Wide and very visibly green corona around the nice hotspot. Texas_Ace should get a couple of same leds in a week. I would like to see dead test. I know they are good under 1A (better than XP-G3?) but probably far away over 5A. 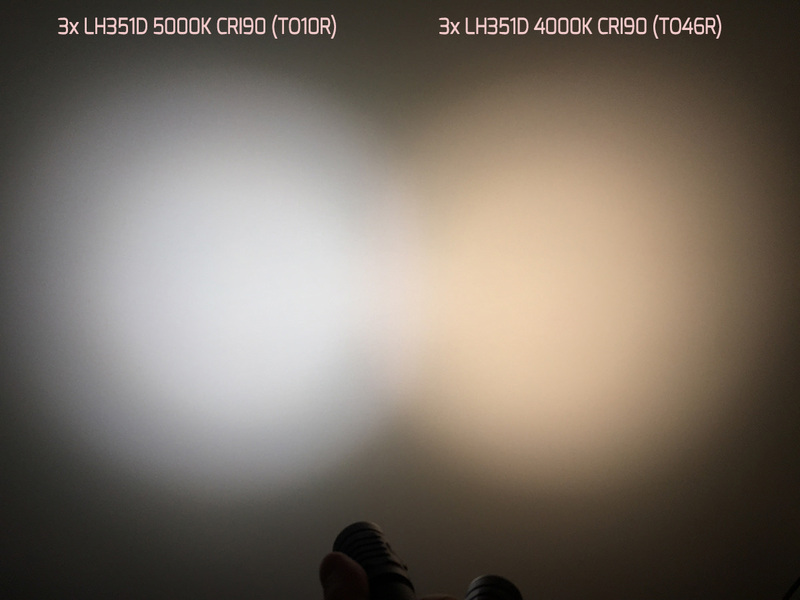 Got some LH351D 5000K CRI90 emitters (SPHWHTL3DA0GF4RTS6 from digikey) and they’re really good as well. I put them in a Wuben TO10R triple with a clear Carclo. There’s just a hint of green on the highest mode, but I wouldn’t complain. Thanks to the smooth and evenly tinted beam, it’s easy to correct with a filter if you’re going to run these very hard. 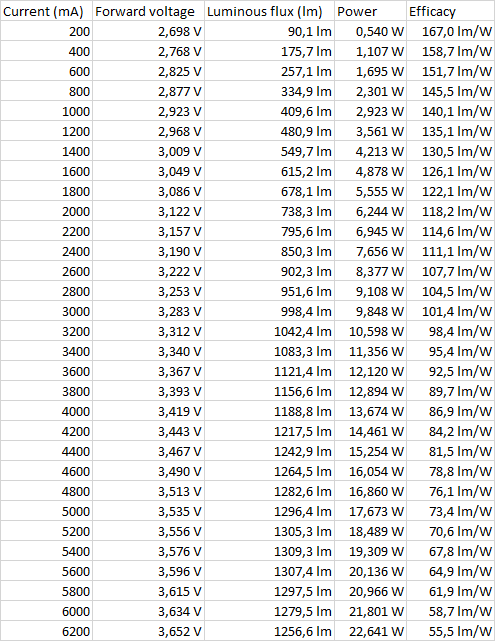 CRI and tint data in ascending current order. 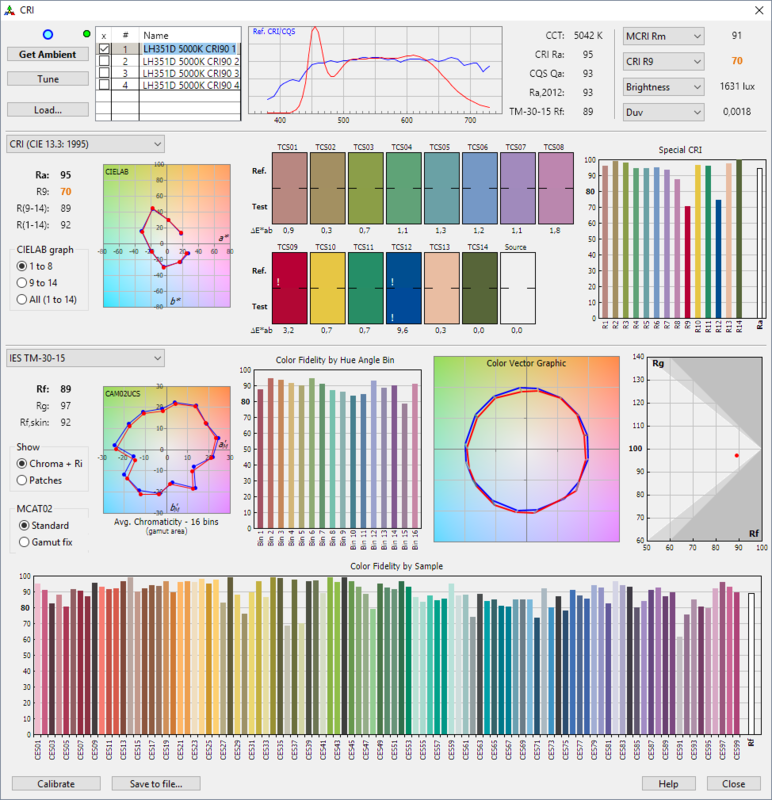 Thanks, those are great tests to evaluate how good these leds are! Output in a sphere. Strange that the output tapers off at 6A while in TA’s test on the CRI70 version went much higher. Maybe my reflow wasn’t perfect. At least the performance up to 4A is very good. 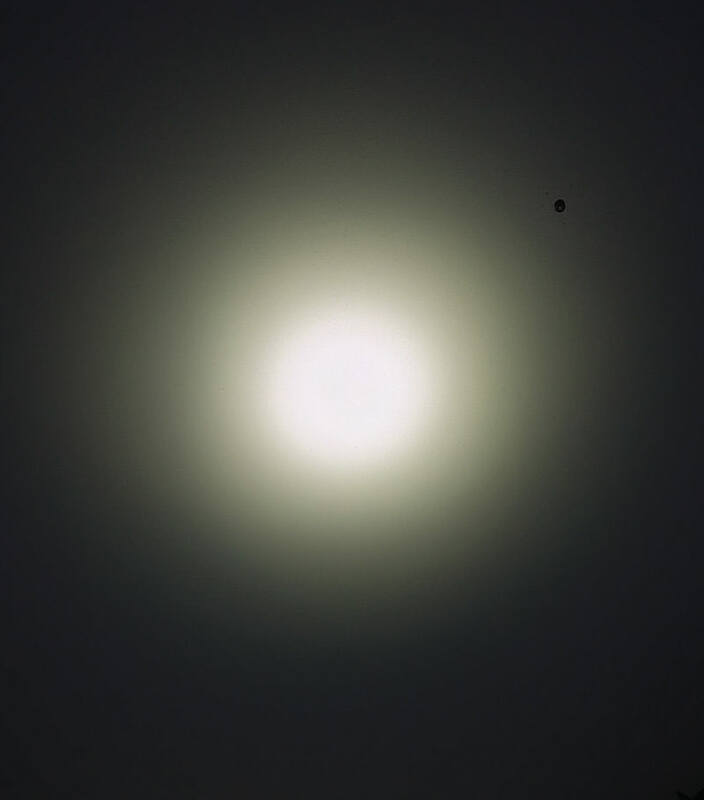 Thanks for the test, indeed 1200 lumen at 4A is really good. Strange things sometimes happen with led tests. 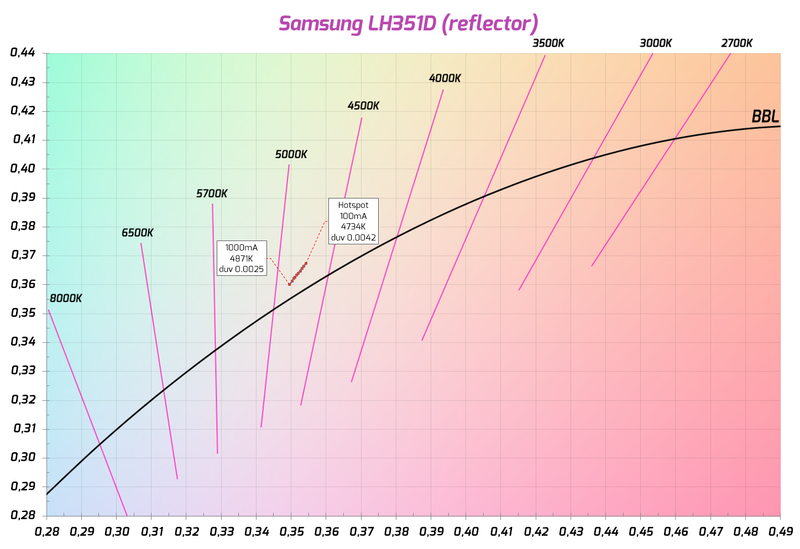 I have done tests on the XHP70.2 that have a maximum at much lower current than TA and Koef3, I blamed that on for my (for that immense power) insufficiently cooled ledmount, but it could have been something else too, I never really found out. Perhaps in your case the thicker phosfor layer which also has a different composition is to blame. There’s just a hint of green on the highest mode, but I wouldn’t complain. 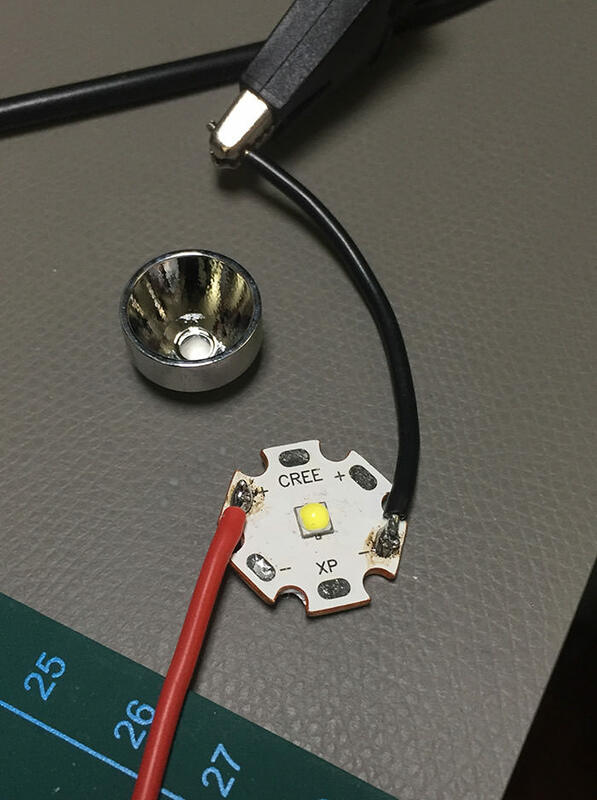 I don’t know if it is a “fair” comparison, but how are these comparable to the XP-G3 5000K 90CRI used in the Wuben flashlights? Are they less green or so-so? With the XP-G3 the center of the spot might be fine, but the tint is all over the place and severely green on the edges. This can be remedied with d-c-fix and a minus green filter. The LH351D is much better out of the box. You don’t lose output but throw does decrease, larger emitter area = larger spot. Thanks for the answer maukka! 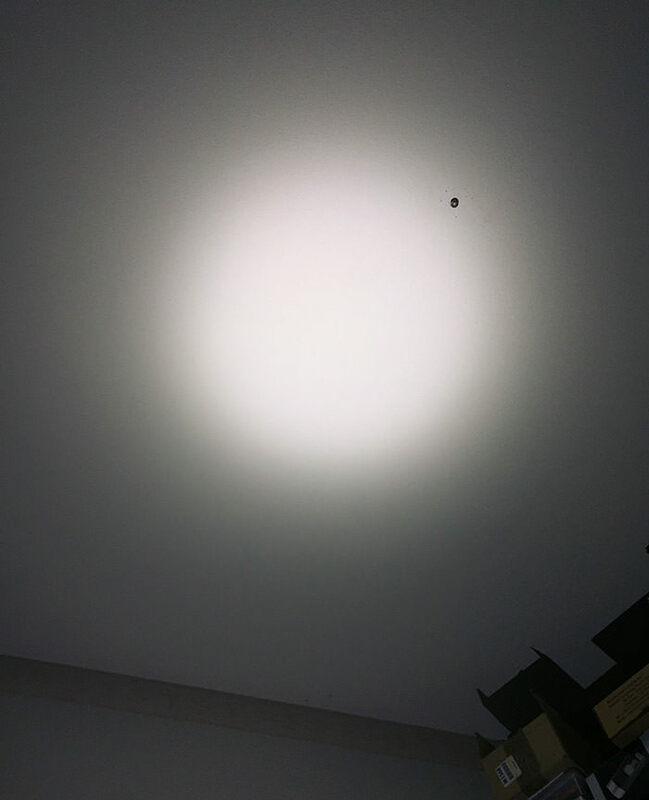 I have DC-Fix on my TO46R due to those shifts of the XP-G3 (even if they are better than the CW 70CRI from the stock lights). The DC-Fix did help to improve a lot. And that was the reason I was asking, to check if this would be less green. And you confirm! Thanks for the test, indeed 1200 lumen at 4A is really good. Strange things sometimes happen with led tests. 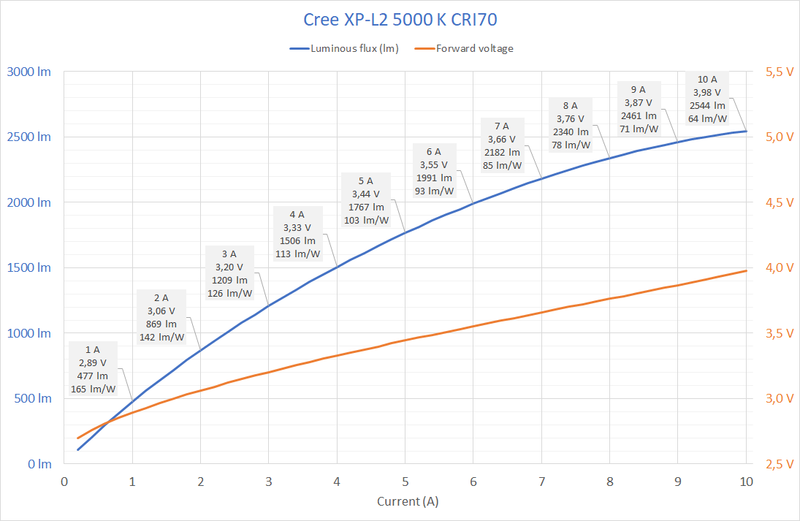 I have done tests on the XHP70.2 that have a maximum at much lower current than TA and Koef3, I blamed that on for my (for that immense power) insufficiently cooled ledmount, but it could have been something else too, I never really found out. Perhaps in your case the thicker phosfor layer which also has a different composition is to blame. 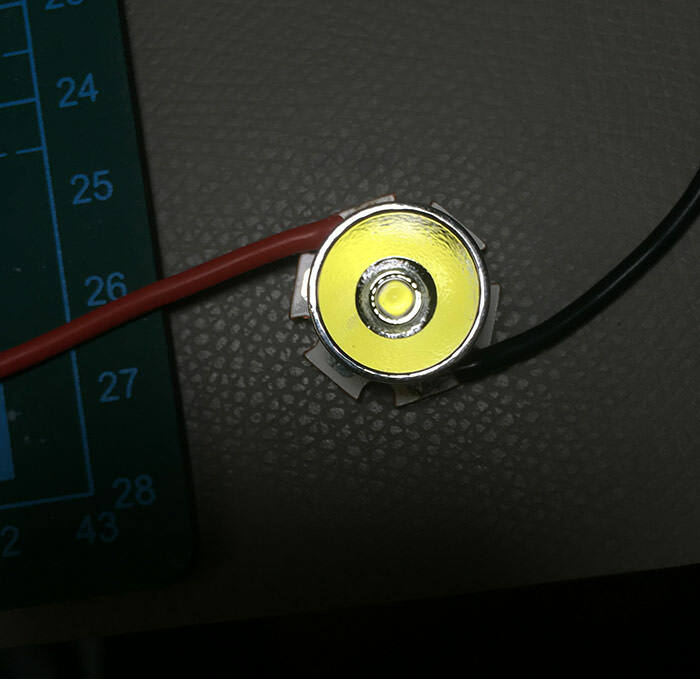 CRI70 version of the LH351D topped off at about 6 amps with two different heatsinks and fans. 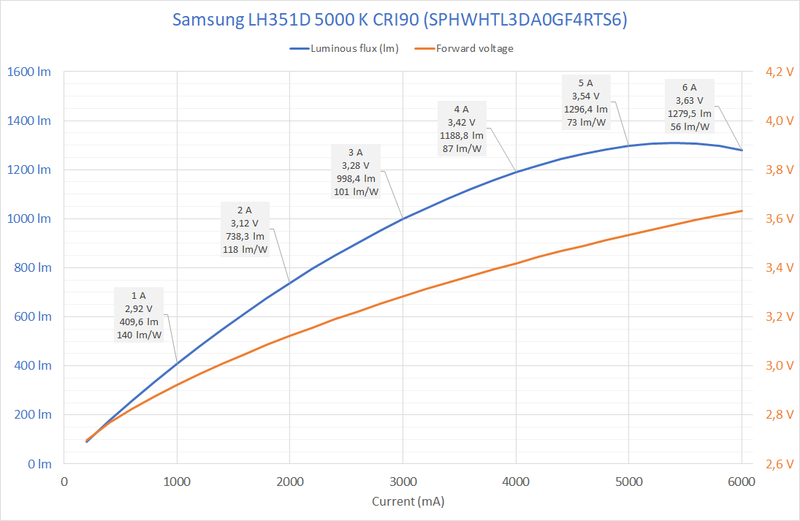 The heatsink shouldn’t be to blame since I also tested an XP-L2 CRI70 and it went nicely all the way up to 10A with more output and better efficacy than in TA’s test. No idea about the binning of my sample since it came from Kaidomain. Could also be the nondescript MCPCB I used for the Samsungs. Kaidomain Cu DTP for the XP-L2. 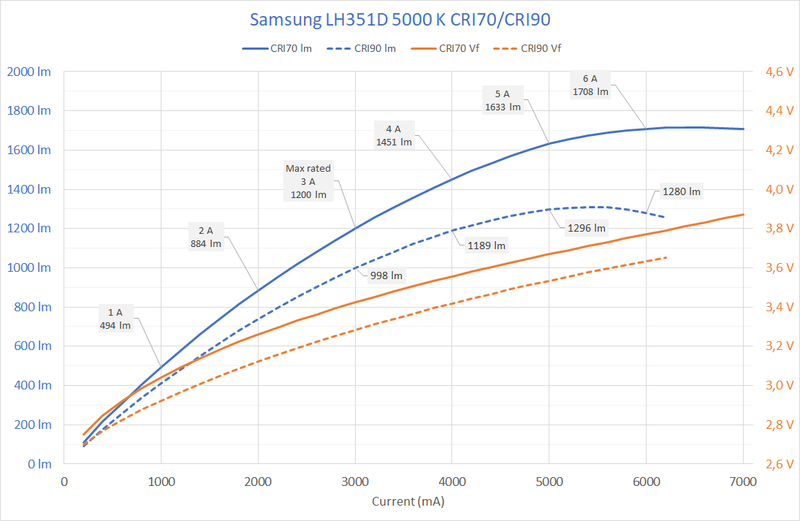 The differences in Vf between the 70CRI and 90CRI are interesting and substantial, even at low test currents, where resistive effects are minimized. That suggests to me that the 70CRI are using a shorter wavelength die to emit higher-energy photons. I’m not sure how commonplace this is for other manufacturers and emitter families. maukka, thank you for taking the time to do all your testing. I must admit that I need to learn how to interpret your results. What must seem obvious to some is lost on me. Can you point me to a website that will help me decipher your CRI charts and graphs?